Will Eli Broad Finally Step In And Save The Los Angeles Times? 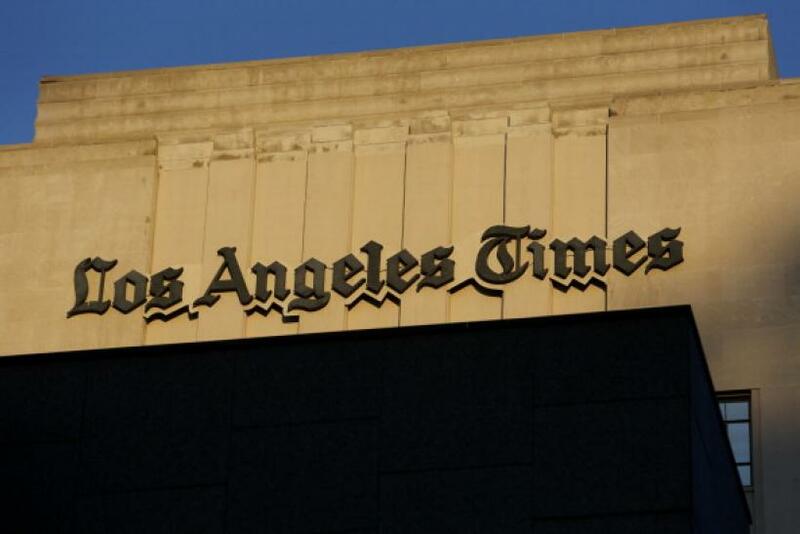 LOS ANGELES -- The Los Angeles Times has been steadily downsizing since before corporate raider Sam Zell bought its parent, Chicago’s Tribune Co., and saddled it with billions in debt amid declining ad revenues. But the paper’s most recent bloodletting was still stunning. A whopping 82 out of about 500 staffers left during the latest round of buyouts, including the paper’s correspondents in London, Las Vegas and Seattle, a slew of veteran editors and longtime columnists Bill Dwyre and Sandy Banks. But now, with the newspaper cut to the bone, is it time at last for that hometown savior to emerge? And if so, will Spring Street finally become Broad City? Rupert Murdoch tweeted last Friday that he had a “strong word” that Tribune’s newspapers would be acquired by a Wall Street firm, and the Times would go to a local group led by billionaire philanthropist Eli Broad. Tribune released a statement Monday denying it was pursuing a sale of the company -- but mentioning nothing about the Times. The speculation sent the company’s stock soaring about 18 percent since markets opened Monday. Austin Beutner and Broad tried and failed to buy the paper in March 2013, before the former was installed as publisher, replacing Eddy Hartenstein. Broad told the Los Angeles Business Journal in September that he submitted an offer at the request of Hartenstein, now Tribune Publishing’s chairman, to buy the Times and San Diego Union-Tribune, which Tribune acquired in May. Tribune’s other directors rejected that offer, and Beutner was fired shortly after. However, the time does seem as ripe as ever for an opportunistic buyer to save the paper from being whittled away even more. One investment banker, who requested anonymity because he has worked with several potential suitors, said he’d be surprised if a deal doesn’t happen soon. Other usual suspects include media mogul David Geffen and supermarket billionaire Ron Burkle, who have previously circled the Times. Patrick Soon-Shiong, a biotech CEO who’s Los Angeles’ richest man, has also been sniffing around, the investment banker said. And there’s also Bruce Karsh of Oaktree Capital Management, which owns about 18 percent of Tribune Publishing’s stock. But speculation about the LA Times still begins and ends with Broad. His interest in the paper has been rumored since before Chicago was a dirty word in its newsroom, and the billionaire liberal philanthropist savior storyline is compelling. Analogous situations, like John Henry’s takeover of the Boston Globe and Jeff Bezos’ acquisition of the Washington Post, have resulted in new coverage initiatives and expanded head counts. The investment banker said the big hurdles for any potential Times deal are mainly lining up acquisition financing and squaring away details like unfunded liabilities, not meeting Tribune’s asking price. He said Broad and all other realistic Times buyers have already done their due diligence and know what the price will be based on comparable transactions, and expects one of the rumored names, most likely Broad, to own the paper before the end of 2016. A “surprise buyer” would shock him, he said. With a market capitalization of about $250 million and a little more than $400 million in debt, it would take an estimated $650 million or more to acquire Tribune Publishing, which Tribune Co. spun off last year in a move designed to shield its television stations from the financially challenged print business. Tribune Publishing also includes the Chicago Tribune, Orlando Sentinel and Baltimore Sun, along with other smaller publications. Analysts estimate the Times makes up about 40 percent of Tribune Publishing’s revenue. While it may not fetch the $250 million Bezos paid for the Post, the Times should go for significantly more than the $85 million Tribune shelled out for the Union-Tribune, which has less than half the Times' paid circulation. The stage for the latest exodus was set when Austin Beutner, the former private equity CEO and LA power broker, was fired as publisher of the Times on Sept. 8 after less than a year on the job, allegedly for clashing with the cost-cutting ethos coming from Chicago. He was replaced by Tim Ryan, who came over from the Baltimore Sun. Beutner’s ouster resulted in a group of 50 civic leaders, including billionaires Broad and Anthony Pritzker and former mayors Richard Riordan and Antonio Villaraigosa, signing a letter to Tribune Publishing in which they expressed their fierce opposition to the publisher change and calling for new, local ownership. The LA County Board of Supervisors even weighed in, passing a unanimous resolution saying the same. Will Wright, the director of government and public affairs for the American Institute of Architects Los Angeles Chapter -- and one of the civic leaders who signed the letter to Tribune -- said he just hopes the paper can find a local savior before it atrophies even more.